With the yarn district fully explored, it was time to move on to textiles, in particular the gorgeous weaving I'd been spying about the place. Obviously the first area to go looking was our very own barrio (neighbourhood) – Recoleta. It's quite a well-to-do suburb, so the shops and products were good quality. There is a small shopping centre on Av. Alvear, called Galeria Alvear, where we spent quite a bit of time (and money! ), in particular, a little store called Maria Mateos that specialised in silk handwoven scarves and wraps. Now, my Spanish is non-existent and Lou's (my travelling companion) is pretty basic, so this information may have been lost in translation, but we were chatting to the owner of the store, who said that she and her two female partners make everything in the shop. 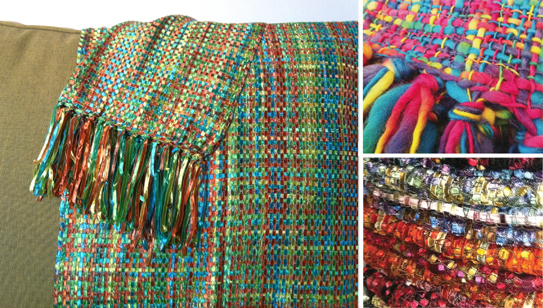 It takes them about nine hours to weave a small scarf and 20 hours to weave a wrap. There were so many lovely colourways to choose from, and we came out with about ten purchases between us. Left: One of wraps that came home with me. Top right:The wrap I had enough self-control to put back. Bottom right: A small selection of the scarves. Once our own suburb was exhausted it was time to brave the subway and check out some places further afield. Between google research and Time Out magazine I'd managed to source a few stores that predominately advertise themselves as fair trade handcraft stores. They included Amaicha, Arte y Esperanza and Artisanias Argentinas. The range of textiles in these stores was usually quite small, but they did have some nice silver- and woodwork. Arte Etnico Argentino, was the very last shop I went into on the trip. Unfortunately for them, I could no longer fit anything even in the extra suitcase, so it was browsing only! Arte Etnico highlight their socially responsible practices – their aim being to "contribute to the development of local cultures by increasing their production and helping preserve their traditions in a sustainable environment". Many of the textiles are quite old, but they also sell furniture which is a mix of antique and new products made in their workshop in the north of Argentina – the dry-forest region of Santiago del Estero – which is part of the only dry, subtropical forest in the world. There is a link on their website explaining the production processes and a piece on the fate of the forest by one of the shop owners here. There are two store owners, and they have also written a book about the textiles and the people they source them from – 'Teleras: weavers from Argentina's dry forest'. I plan to track down a copy as I was looking at it in the shop and it was a beautiful resource. Obviously these aren't the only places selling traditional textiles in Buenos Aires, and as with the yarn stores, a number were closed for the Christmas break. So, if you are planning to head to Buenos Aires and want some more options, feel free to email me. They are just gorgeous. How did you have enough self control to put the colourful one back. It is so your colours. There was quite a lot of discussion around that wrap! But in the end, both Lou and I decided the one with the greens, yellows and aqua looked better against my skin. I think the wool one was a bit too blue-toned. Let's face it, enough came home in my bag as it was!